I found this recipe on Weight Watcher’s website while looking for something to do with the chicken breasts I had pulled out of the freezer. I was looking for something fresh and light for a Thursday night and this seemed like the perfect recipe. Ever since spending a month in Greece a few years ago, I have yearned to recreate some of the flavors I experienced. This recipe got me a few steps closer with the lemon-dill grilled chicken that is reminiscent of chicken souvlaki. Branden and I both really enjoyed this salad and it was suprisingly really filling. The fresh flavors made this an instant summer time hit that would be beautiful served at a intimate dinner with friends in the back yard. Execution was a cinch and I can’t say I’d change anything about this recipe (except maybe add some more cucumbers because we pretty much devoured them!). In small bowl, combine water, oil, lemon zest and juice, garlic, salt, and pepper; remove 1/4 cup of dressing and place in a large glass bowl. Add chicken to bowl and turn to coat; cover bowl and refridgerate at least 1 hour or up to 8 hours. Cover and refridgerate remaining lemon mixture for dressing. Grill chicken, turning as needed, until cooked through, about 10 to 15 minutes. 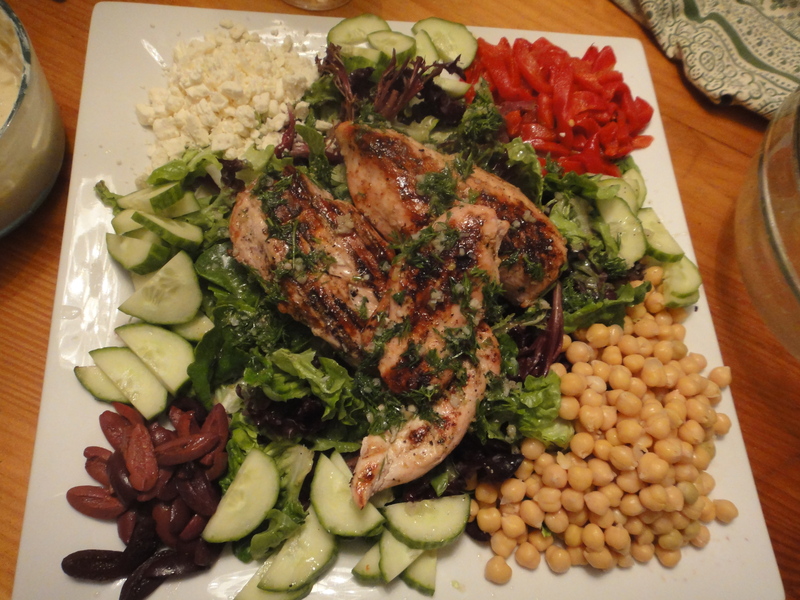 Place lettuce on a serving platter; arrange vegetables, chickpeas, chicken, olives, and cheese on top. Stir dill into reserved dressing; drizzle over salad. I love the presentation! And a month in Greece, must’ve been heaven. I’d love to try this recipe and have for my own, a delicious taste of Greece!